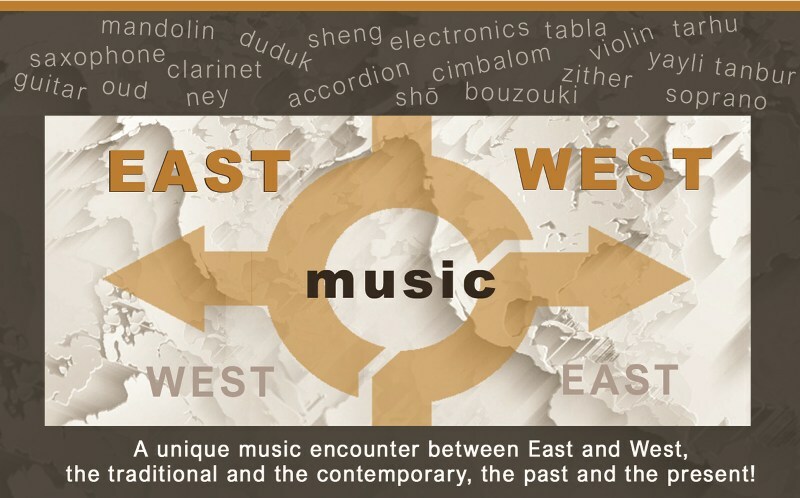 “EAST music WEST” is the title of the 9th International Pharos Contemporary Music Festival as it is focused on the evolution of traditional music into what we now identify as ‘new music’. Organised between 6 and 13 October 2017 at The Shoe Factory in Nicosia, the Festival aims to stand as the meeting point of traditions from east to west, from the past to the present: a crossway in which instruments from various cultures mingle with their western descendants, a hybrid platform where the joint but also the contrasting music elements from various traditions around the globe are exposed, and a unique sonic experience where oral and improvisational practices are combined with modern notation and compositional techniques. The Festival will present four distinct concerts, while a number of other corresponding activities, such as lectures, workshops and educational activities, will take place throughout the week. The first concert of the 9th International Pharos Contemporary Music Festival, on Friday 6 October 2017,will travel us to the Far East and the transcendental sounds of the Chinese Sheng and the Japanese Shō. The Sheng is one of the oldest wind instruments in the world, with a history over 3.000 years. Consisting of several bamboo pipes set in a small windchest, the Sheng has played a significant role in the development of Western musical instruments, including the accordion and the harmonica, as well in the East, where many similar instruments were born out of it. One of these instruments is Sheng’s smaller sibling, the Japanese Shō, which has a very distinct sound, said to be imitating the call of a phoenix, and which has been the source of inspiration for a number of contemporary composers. The Festival is proud to welcome for the first time in Cyprus the world famous Sheng player Wu Wei, who will join forces with the brilliant Shō player Naomi Sato. Having appeared as a soloist with many leading orchestras around the world, including the Berlin Philharmonic Orchestra under Kent Nagano and the Los Angeles Philharmonic Orchestra under Gustavo Dudamel, Wu Wei has helped to develop the Sheng into an innovative force in contemporary music, by creating new techniques, expanding the new repertoire and integrating different styles and genres. Naomi Sato studied the Shō at the Tokyo National University of Fine Arts and continued her studies at the Conservatorium van Amsterdam. She has appeared as a soloist with a number of orchestras and ensembles including Orchestre de L’ Académie Européenne de Musique with Pierre Boulez, Ensemble Labyrint, Ives Ensemble, Ictus Ensemble and Diotima Quartet. The second concert of the Festival, on Sunday 8 October 2017, will be an exciting percussion experience by Shawn Mativetsky – one of the most dynamic performers of Tabla in the world and a pioneer in bridging the worlds of Western and Indian classical music. Mativetsky is described by the media as “an exceptional soloist” and “as a leading disciple of the renowned Pandit Sharda Sahai”. His instrument, the Tabla, is regarded as the queen of the percussion instruments and it has a very distinct sound that makes it an integral part of Indian music. Originally associated with the Indian classical dance Kathak as well as the dance traditions of the Tawaifs (sophisticated courtesans during the Mughal rule in the mid-18th century), the Tabla (consisting of two drums, the Bayan and the Dayan) is now used in a variety of genres and styles of Hindustani music. In Northern India, the Tabla is a ubiquitous instrument which accompanies Hindu religious songs (Bhajan), Sikh linguistic performances (Shabad), the ritual music of the Sufis (Qawwali) and Arabic sonnets (Ghazals). Its sophistication and charm has attracted the attention of scholars, musicians and music lovers around the globe. The popularity of the Tabla as a solo instrument continually grows as time goes on, as the instrument can hold its melodic own for hours and yet not sound boring. It is a much sought after instrument in cross-cultural and fusion musical experiments, and apart from classical music, the Tabla has made its mark on devotional, theatre and film music. The third concert of the Festival, on Wednesday 11 October 2017, will host for the first time in Cyprus the outstanding Ensemble C Barré which will join forces with soprano Sarah Maria Sun, under the direction of Sebastian Boin. Associated with the National Centre for Musical Creation of Marseille and having appeared in such venues and festivals as the Philharmonie de Paris, the Grand Théâtre de Provence, Festival Les Musiques and Festival de Chaillol, C Barré is an ensemble of unique personality, quite distinct from today’s musical landscape. The makeup of the Ensemble is unrivalled (clarinet, saxophone, trumpet, percussion, accordion, mandolin, guitar, harp, cimbalom, keyboards, cello and double-bass) and is enriched by the dynamism and thirst for experimentation of its musicians. Furthermore, the Ensemble regularly takes on other instruments – as in the case of their concert in Nicosia, which will also include instruments such as bouzouki, the Armenian Duduk and zithers. The concert will feature works by Iannis Xenakis, Igor Stravinsky, Benjamin Britten, Alexandros Markeas, and world premieres by Mikel Urquiza, François Rossé and George Christofi. On Friday 13 October 2017, the 9th International Pharos Contemporary Music Festival will end its journey through the various world music traditions, in an eastern Mediterranean flair with the Lingua Franca Ensemble. The Ensemble, comprising Michalis Cholevas (Yayli Tanbur, Tarhu, Ney), Giannis Koutis (Oud, Guitar), Michalis Kouloumis (Violin) and percussionist Ruven Ruppik (Riq, Darbuka, Frame Drums, Marimba) – all graduates of the Codarts University of the Arts in Rotterdam, circumnavigates on a musical wandering during which the rich eastern Mediterranean traditions and western music elements blend and compose colourful soundscapes. Always abiding by the character of the modal music cultures, Lingua Franca will present a unique programme, which will also include world premieres by composers Vasilis Filippou and Andreas Tsiartas.